Lord, today we pray about the new medical technology that is showing great promise in helping paralyzed people walk. 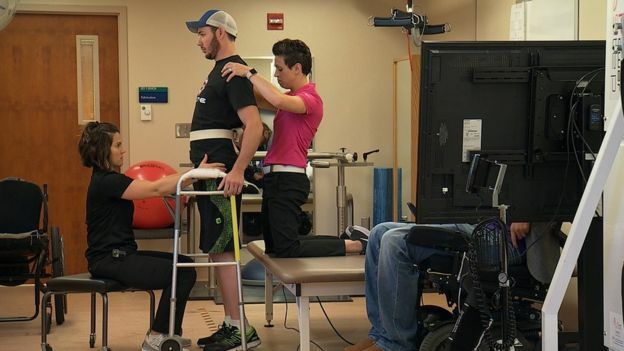 We rejoice that Kelly Thomas, Jeff Marquis and Jered Chinnock have all had some success walking since being fitted with electrical patches on their spinal cords and receiving extensive rehabilitation therapy. We pray for their continued success. Lord, we also pray for the further research necessary in developing this technology for broader use. May all those involved in this process persevere and find success with this technology. We desire to see this option ultimately available for patients around the globe. Thank you for granting us creative minds to explore the options provided in this vast world. May we continue to be resourceful in meeting the needs of the suffering. In Jesus’ name we pray, amen.